Leslie and Neill Macpherson grew up in Asia and have retained a love and connection for the region. Their family are now scattered around the globe and their home in Thailand provides a central point for everyone to get together. They love the Buddhist culture, the warm, hospitable, friendly Thai people and the delicious food. Simply put, whenever they visited the “Land of Smiles” they felt that they were coming home. Why did you choose Koh Samui? We specifically chose Koh Samui as it is a magical island. We felt Samui would avoid the high rise developments of other popular destinations as the building regulations state you can’t build higher than a palm tree! What is so special about the Fisherman’s Village? It’s a charming location with its original, wooden Chinese shop fronts. The village reminds us of the way Asia was 50 years ago, and is one of the few places that has managed to retain this charm. It is also the dining hub of Samui, with chic boutiques and the famous Friday night “Walking Street” market. 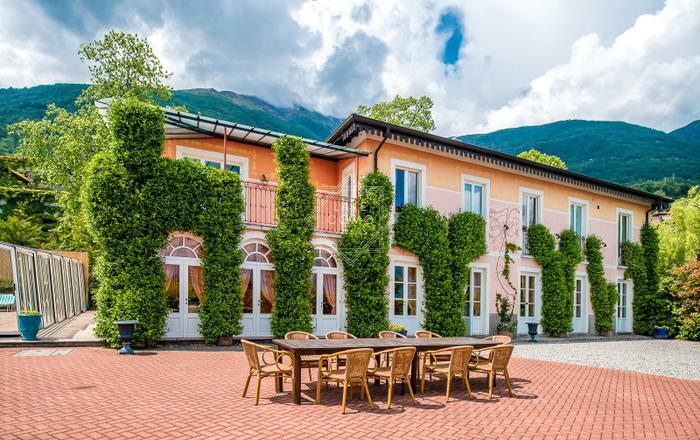 What was your inspiration behind the unique design and decoration of Villa M? We wanted to create an elegant, modern, colonial home. Our priority was for the design to be in harmony with the village architecture and the environment. All our floors are crafted from recycled teak. We drew inspiration from the colonial homes we remembered and loved growing up in Asia, in the 50’s and from gracious hotels such as The Oriental Hotel in Bangkok and Raffles in Singapore. Villa M's absolute beach front location in one of the most sought after locales on the island, Fisherman’s Village on Bophut Beach. Our intimate Indochina style and wonderful collection of antiques from all over the East. The themed white on white canvas with teak floors extends the outdoors inside, blurring the lines between indoor and outdoor living. What is your favourite time of the year on Koh Samui? We love Koh Samui all year round and really do not have a favourite time. There is always something to do and see on the island -a festival, a sporting or cultural event or simply relaxing and unwinding in the villa. However, my husband particularly loves May when it’s hot and dry. What is your favourite spot at Villa M and why? This is difficult to answer because everywhere in Villa M is special to us! However, there are a few that are perfect for certain times of the day. The deck is a magical place to sip a cup of coffee and watch the sunrise. Reading a book under a palm tree on the beach, with the turquoise sea just a few steps away. Sit in the Jacuzzi with a cocktail on the roof top terrace at sunset! Falling asleep, in a beach facing bedroom, to the quiet lapping of the waves. Which little to unknown restaurants would you highly recommend? We have a couple of great local restaurants close to Villa M. Elysia serves organic food and juices and The Hut which has great, authentic Thai food with a rustic atmosphere. The Jungle Club, in the mountains above Chaweng, is “the coolest” spot on the island in every respect and has the best panoramic views of Koh Samui. 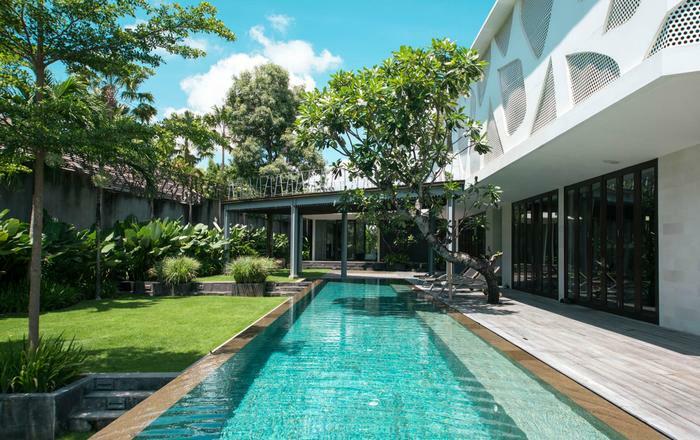 "Villa M’s (Villa Macpherson’s) absolute beach front location in one of the most sought after locales on the island, Fisherman’s Village on Bophut Beach. Our intimate Indochina style and wonderful collection of antiques from all over the East.The themed white on white canvas with teak floors extends the outdoors inside, blurring the lines between indoor and outdoor living. It is difficult for words on a website to convey just how special Villa M is for it represents a unique Samui experience. 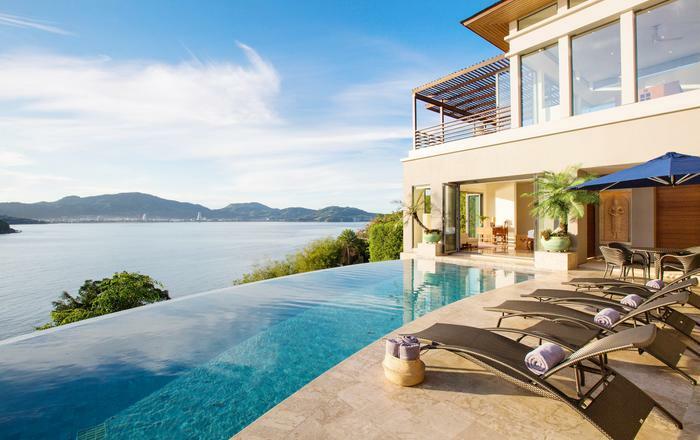 The villa is a stand out on this island paradise for a number of reasons. Although quiet and secluded, it is the only residential villa that is as close to the boutique resorts, chic shops and sophisticated restaurants of picturesque Fisherman's Village. 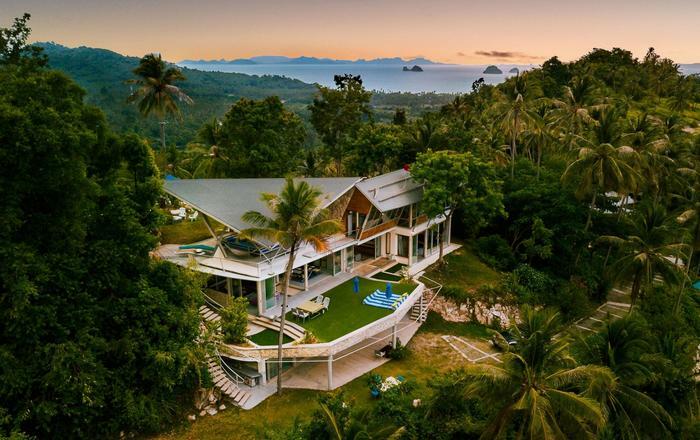 It is a three-storey absolute beachfront home which is rare on Samui and the colonial inspired design, furnishings, impressive art collection in this relaxing home all work together to create, simply, an amazing property. The exterior with its white facade contrasted by the antique Shanxi wooden doorway is eye catching. 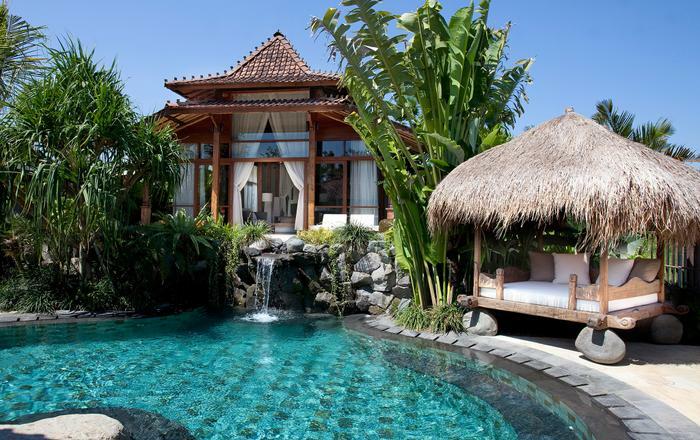 This opens into an inner courtyard of tropical plants and then through into the villa itself. Once in the hallway the interior is a tasteful extension of the exterior with white walls, plantation shutters and the rich texture of reclaimed teak floors. Each room in the home is comfortable and contemporary, but with an intimate Indochine feel with furniture from Burma, Laos, Vietnam, Cambodia and, of course, Thailand. A teak wood floating staircase linking each floor is a focal point, featuring a collection of Samui vintage photos on each level. From the hallway, on the left, there is a concealed laundry area and a private study which offers a quiet place to relax and read novels from the library. There is an interesting collection of old books, photos and memorabilia. Back into the hallway, a grand teak mirror faces the staircase and, on the right, the entrance to a Queen en-suite bedroom with bathtub. As with all the rooms it is charmingly decorated and reflects a feeling of yesteryear. The hallway opens into the main living area, with absolute beach front and the Gulf of Siam in front of you. On the left is a designer kitchen separated from the dining area by a breakfast bar. Silver bar stools complement the glass-topped dining table which is surrounded by bone inlay chairs from Rajasthan. To the right there are two deep cream sofas, an exotic Anglo Indian coffee table and a personally autographed photo of Yul Brynner. A wall-mounted flat TV, a Gujarat chest and a guest bathroom are additional features in the sitting room. Outside there is an extensive teak deck, an aqua swimming pool and a lawn which flows onto a private sandy beach fringed by palm trees. Back inside and heading up to the next level, the landing area wraps around the staircase and takes you to a floor to ceiling glass window overlooking Fisherman's Village. Next to an elegant mother of pearl doorway is a Queen en-suite bedroom with a large balcony and a village outlook. In front of the staircase the room opens out into a second sitting room, another wall mounted flat TV, antique chests, leather suitcases, cabinets and side tables. A Queen bedroom with en-suite bathroom, including a large bathtub also extends from the rear of the sitting room. Across the width of this floor facing the beach is a balcony complete with Burmese plantation chairs from which you can relax and enjoy the sea view and watch the sunset through swaying palms. To the right, folding doors reveal another Queen bedroom enjoying magnificent beach views, separate dressing area and en-suite bathroom. The final staircase ascends into the third-floor suite. To the right of the staircase is the master King bedroom with access to two large terraces both ideal for sunbathing and out door dining, with either village or beach and water views. Steps from the front terrace lead to another level which contains the final luxury indulgence, a sunken rooftop Jacuzzi, a large decked entertainment area with a bar, storage rooms and a further bathroom. This is an especially idyllic spot with views over the pool, the garden, the fishing harbor, the beach and across the ocean to Koh Phangan. The exquisite furniture from India, Oman, China, Thailand, Bali, Vietnam, Laos and Burma and artworks from the owners' private collection compare with no other property on Samui. None has been styled or dressed with such flair, taste and eye for detail. The design and ambiance of the villa create a modern relaxed environment, making it perfect for families or couples to share, with each floor providing comfort and privacy when required, whilst also allowing for guests to rest and enjoy their time together. 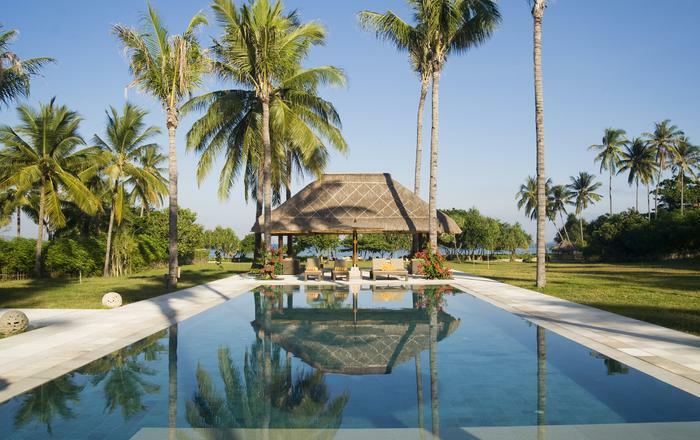 The special personal touches and the exceptional furnishings make Villa M a quintessentially Asian experience. Whether your family and friends are here to enjoy Samui's natural and cultural wonders, to celebrate an event or wedding, or simply to relax in a luxury beachfront home with plenty of nearby international dining options and entertainment venues, Villa M promises a stay on the island which is unique and unforgettable. Daily rates and Extra Beds include 10% service charge and 7% tax. 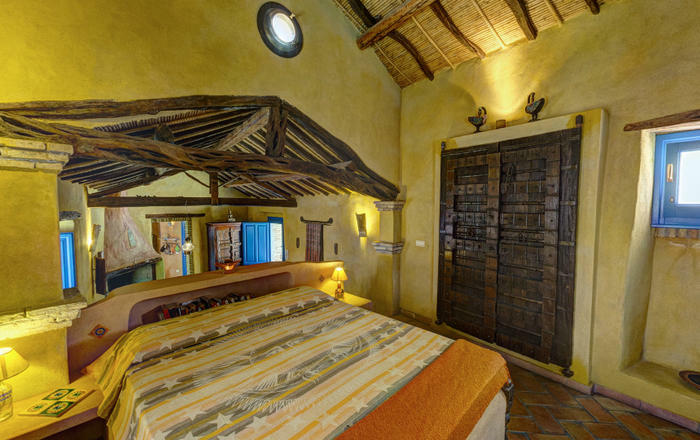 Rates shown are for a maximum of eight (8) Guests (including children) or six (6) with reduced occupancy.